Inscribed Altoghther on the UNESCO WORLD HERITAGE LIST in 2004. Tamil Nadu, a south Indian state, literally means the country of the Tamils. Tamils, like other people who speak Dravidian languages, which are completely different from the Sanskrit spoken by the northern Indian Aryans, are referred to as Dravidian people. India is divided into local states based on the common language spoken in each area. Dravidian people live in the states of Andhra Pradesh of the Telugu language, Karnataka of the Kannada language, Tamil Nadu of the Tamil language, and Kerala of the Malayalam language; those four states are usually referred to as South India as a whole. The largest state among them is Tamil Nadu, where the great Chola Empire flourished in the middle ages and developed an architecture of huge temples suitable for the scale of the state. Its representative temple is the Brihadishvara Temple of Thanjavur (Tanjore), which is the largest in size, attracts a large number of followers and pilgrimages, and was inscribed on the UNESCO World Heritage List in 1987. However, the Tamil region also embraces an architectural heritage of many other Dravidian temples, so it was re-inscribed together with the great Brihadishvara Temple of Gangaicondacholapuram and the Airavateshvara Temple of Darasuram in extension to the same list in 2004. Since the temple of Thanjavur has been already put on this website, I have remade the page in adding the other two temples taken from �gThe Guide to the Architecture of the Indian Subcontinent�h with many photos and drawings. When the Brihadishvara Temple dedicated to Shiva was completed in the capital of the Chola Empire in the early 11th century, its priests went around the country to seek unmarried pretty girls to make them �eDevadasies,�f which means �eGod�fs servants.�f They belonged to the temple with the role of dedicating dances to the main god Shiva, for the purpose of which they had to be virgin and come from a good family, for they would hold the matrimonial ceremony with the God after finishing their education. These selected Devadasies entered this great temple before puberty, mastered dancing, and entertained the God by singing and dancing every evening, revering their future husband. The wall paintings, from the age of the foundation of the temple, discovered in the 1930�fs at the Vimana of the Brihadishvara Temple, depict Apsaras (celestial nymphs) dancing in the heavens with Vishnu, the preserver of the universe. The famous dance of �eBharata Natyam�f performed by Devadasies, just as in these well preserved wall paintings, is now danced not only in the Tamil region but also all over India. It is at the Pradaksina-Patha surrounding the Vimana that these paintings were found. A pradaksina-patha is a circumambulatory passageway around a sacred image or building in which people walk while reciting Sutras in a clockwise direction. The walls and ceilings were covered with paintings in the Nayaka Dynasties in the 17th century over the top of far older paintings from the 11th century, which have now emerged to be seen again. On the south wall of the Pradaksina-Patha Shiva is depicted preaching under a sacred tree, on the north wall Shiva is shown exterminating demons residing in three cities, and on the west wall is Shiva welcomes a saint on Mt. Kailasa in the Himalayas. In one scene, Shiva with eight arms is on a chariot being lead by the god of creation, Brahma, and in another scene, he practices yoga on a tiger skin, wearing a serpent on his neck and upper arm. There is also a drawing of Rajaraja I standing with his Guru (teacher) Karuvur Thevar. In spite of the passage of long period of time, these paintings are in a good condition thanks to the protection from outer air, provided by the covering of thick stucco. They are quite precious as the only surviving Chola paintings. The Brihadishvara Temple was completed in around 1010 in the southeastern part of the new capital Thanjavur constructed in the basin of the Kaveri (Cauvery) River by the king of the Chola Dynasty, Rajaraja I (r. 985-1014). It has also been called Rajarajeshvara Temple after the king�fs name. It is one of the two greatest templesfrom the age of the Chola Dynasty together with the Rajendra-Cholishvara Temple built in the next new capital, Gangaikondacholapuram, which was constructed by his successor Rajendra I. Those constructions were prodigious national projects showing the Chola Empire�fs hegemony in south India. The delta area on the pivot of Thanjavur was a fertile granary since ancient times, called the �egarden of south India.�f The successive Hindu kings erected a lot of temples in this area, the largest among which is the Brihadishvara Temple. Rajaraja I was the restorer of the weakened Chola Dynasty, extending his power from south India to Sri Lanka, the Maldives Islands in the Indian Ocean, and even to the Laccadive Islands in the Arabian Sea. It is said that the Brihadishvara Temple was erected in only seven years. Its precincts are surrounded with cloisters covering an area of 120m by 240m and is also surrounded outside with heavy brick walls for an area of 350m square including a large tank (reservoir). There is a Nandi Shrine, two continuous extensive Mandapas (worship rooms), an Antarala (antechamber), and a Vimana with a high tower, all in line on the east-west axis. 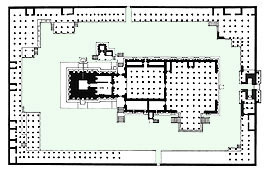 On the same axis stand Gopuras (temple gateways) of the early phase at the eastern center of the cloister and the brick wall. They are the sole entrance spots to the temple precincts. Though they are embellished with sculptures, they look much lower than later Gopuras of huge temples in south India, as the height of the Vimana is great in contrast. The second Gopura on the line of the cloisters is 24m in both width and height, lower than the first Gopura, but its sculptures are larger, with a pair of Dvarapalas (guardian figures) on both sides of the doorway. In the cloisters surrounding the precincts is a line of Lingas (phalluses), symbol of Shiva, and wall paintings from the Nayaka period on the rear walls delight the eye of pilgrims. This Brihadishvara Temple made of granite and brick is the greatest work of the Dravidian (northern) style in its grand scale and high degree of perfection, alongside of the great temple in Gangaikondacholapuram. The development of stone temples in the southern Indian style, having started at the small temples at Mahabalipuram, reached their summit here. It became the model of the temples to be built in south India and Southeast Asia in the period of the Chola Dynasty. However, after the end of the Chola Dynasty in the 13th century, temple style would change dramatically. Huge Vimanas would not be built anymore, rather temple precincts would be expanded, surrounding the temple in fold upon fold, and constructing only Gopuras in a colossal scale on the four sides. The outer Gopuras would be erected higher, and would eventually attain more than 60m. The relationship of height between the main shrine and its gates would be completely reversed. From this point too, the Brihadishvara Temple in Thanjavur is the best representative of orthodox south Indian temple architecture. In Hindu society, a temple fills a central role socially and culturally, symbolising the images of a mountain, in which dwells divinity, and a mother�fs womb that produces life. The especially venerated sacred mountains are Mt. Kailasa, the abode of Shiva, and legendary mountain Meru, the center of the cosmos. A temple, where gods visit the human world, is the representation on the earth of a sacred mountain, a place for people to meet gods, and also the center of all nature. On the top of a Vimana soaring in a pyramidal shape is set a hemispherical crown stone forming a boundary between the human world and the celestial world. It is referred to as a Shikhara (mountain summit) in southern India, while in northern India, the term Shikhara refers to the entire tower over the sanctuary including the crown stone. On the top of the Vimana of the Brihadishvara Temple is also set a monolithic Shikhara, which is presumed to weigh 80 tons. It is an enigma even nowadays how this gigantic heavy granite rock was lifted up to the height of 60m. According to one theory, a sloping scaffold must have been constructed 6km long. This Shikhara takes the auspicious shape of an octagonal chalice, which is surmounted with a finial called �eKalasha�f (water pot) which is made of copper covered with gold leaf. The cave-like Garbhagriha (sanctuary) inside the Vimana symbolizes a mother�fs uterus, from the word �eGarbha,�f meaning womb. In the sanctuary of a temple dedicated to Shiva, a Linga is enshrined instead of a statue of the god. The Linga enshrined in the Brihadishvara Temple is so colossal a scaffold is needed to spray holy water onto it. It is supposed to be the largest Linga throughout India. 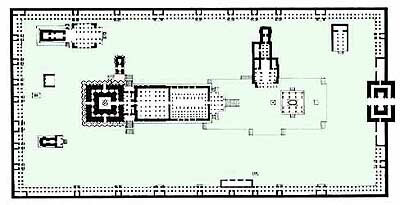 The plan of the Brihadishwar Temple�fs Vimana is about 25m square with a pyramidal tower of 13 steps above the sanctuary. The tower soars up steeply without grand horizontal articulations despite being a southern style temple. The outline of this stepped type tower is quite rectilinear. The vertical walls under the pyramidal tower are divided into two stories. Pilasters and niches, typical of the southern style, give a complicated artistic pattern to the extensive walls. There is a window in the center of the four sides, surmounted with a shrine-like roof, showing the existence of the Garbhagriha inside. The niches on the walls are adorned with the statues of Hindu gods and most of them are images of Shiva. On the south side wall of the lower story is carved Shiva in the form of Nataraja, the Lord of Dance, in a pose of Bharata Natyam. On the base of the whole temple, an imaginary animal resembling a lion, called a �eYali,�f is carved repeatedly and continuously in line. There is sporadically a monstrous crocodile-like animal, called a �eMakara,�f from the mouth of which emerge warriors of the Chola Dynasty. Each step of the tower consists of miniature shrines in neat order in the style of the Pallava Dynasty, previous to the Chola Dynasty. On the four corners of the top step are sculpted, a pair of crouching Nandis (bulls), faithful servants of Shiva. A lot of inscriptions were carved on the basal stones of the Brihadishvara Temple, not only praising the achievement of its builder, Rajaraja I, but also depicting the society of the temple city, Thanjavur. In the precincts of the Brihadishvara Temple, in addition to hundreds of priests, there lived more than 600 people such as dancers, flutists, drummers, Vina players, conch players, canopy holders, water sprinklers, lamp keepers, laundry women, and so forth. These people worked for the temple for half a day, and spent the remaining time on farm work, on land which was lent gratis by Rajaraja I. The contract with the temple was carved on a stone. In exchange for using the farm land, it was their duty to engage in the construction work of the temple and to pull glittering festival cars on festival days. From the temple inscriptions, one can know how much gold, silver, and jewelry, the Brihadishvara Temple possessed. The temple financed shipbuilders, village communities, craft guilds, and so forth, charging interest up to 30%. Even during the period of decline of the Chola Dynasty, the temple could raise large funds for expansion and ornamentation. Thus, many buildings were added in the temple precincts. The shrine of Devi, spouse of Shiva, was constructed at a right angle to the main axis in the 13th century and the shrine of Subrahmanya with fine granite carvings was built in the 17th century on the right behind the Vimana. There was also a temple library for around 20,000 Sanskrit manuscripts near the Ganesha Shrine. In front of the main temple, a large Nandi shrine was erected. The huge interior image of Nandi made of black granite is 6m in length and 4m in height, the largest in India. It glitters like bronze, since it has been polished with large amounts of oil every day. At the lonely town of Gangaikondacholapuram, 35km north of Kumbakonam, a magnificent temple, out of all scale with such a small town, soars in its extensive precincts. This place was once chosen as the new capital of the Chola Empire by Rajendra I (r. 1012-44) and its long name, Gangaikondacholapuram, means �ethe city of the Chola Dynasty that conquered the territory of the sacred Ganges�f. Emulating the Brihadishvara Temple of Thanjavur that his father, king Rajaraja I, had constructed in the former capital, he built a great temple here under the same name, and it was also called Rajendrachorishvara Temple after his name. Notwithstanding the inferiority of its height to the former temple (55m versus 60m), the degree of its architectural beauty and completeness can be said to be paramount. Compared with the Vimana�fs straight lines in the former temple, this temple has elegant and graceful curves in its outline, so it is often described as feminine, as opposed to the masculinity of the former. 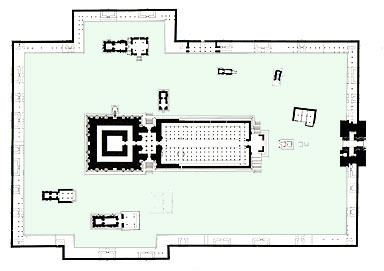 Its plan is simple; the square Garbhagriha (sanctum) is surrounded with a circumambulatory way, in front of which the huge Mandapa stretches through the Antarala (antechamber). Besides the main entrance at the Mandapa�fs frontage, there is a sub-entrance on both sides of the Antarala just the same as in the temple of Thanjavur. The Vimana�fs walls are composed of two stories full of sculptures of deities between rhythmical pilasters and within shrine-formed decor. Originally that two-story composition was to continue to the Vimana�fs walls, but ended unfinished and its walls remains almost plain. In the pecincts are also two small Shiva temples, each of which were built by one of Rajendra�fs queens. Both temples are called Kailasa as the abode of the god Shiva. This is one of the masterpieces of Chola temple only two kilometers from Kumbakonam. Since it was constructed by Rajaraja II (r. 1146-73), it was initially called Rajarajeshvara Temple like the temple in Thanjavur. The temple was elaborately and intricately carved over its entire surface. However, in spite of being the third great temple among those built by the Cholas, the height of its Vimana is only 25m, not even half the height of the Thanjavur temple. A symptom of the change in the south Indian temple architecture had already emerged; the maneristic tendency to elaborate every details of peripheral buildings than to make the central superstructure over the Garbhagriha most prominent, as well as to enlarge the temple area. More and more the Cholas were eager to increase this tendency. Like in Thanjavur, the compound of the Airavateshvara Temple is entirely encircled with cloisters. It is strange that there are no entrance steps at the front of the Mandapa but a part protruding on the left from the Mandapa, functions as the main entrance with steps. Moreover this part forms a chariot-like pavilion with stone wheels drawn by horses and elephants. In and around the 13th century it was the fashion to make temples in the style of a chariot or festival car as if they were going around the heavens, the largest of which is seen in the case of the Surya temple in Konarak. The subsequent and last great Chola temple is the Kampahareshvara Temple of Tribhuvnam (the early 13th century), which is on the top of this page. Its Vimana is more than 10m higher than that of Darasuram.